The holidays are well and truly upon us! You probably have a billion things to get done this week, but might I suggest slowing down a little, taking some time, and building a gingerbread TARDIS to deck your halls for the what remains of the Yuletide season? At its core, a gingerbread TARDIS is actually far simpler than its more popular cousin, the gingerbread house. There are no angled roof pieces that threaten to slide off unless you hold them in place until the icing dries—a TARDIS is basically a box, and anyone can make a gingerbread box! When I set out to create my confectionery time machine, I found many examples of beautifully and painstakingly crafted creations, a lot of them works of art. But I knew from the beginning that that was not necessarily where my path lay. The gingerbread houses that warm my heart are the ones that are brimming with color and candy, and I knew that was the type of gingerbread TARDIS that I wanted to build. It wouldn’t be fancy, it wouldn’t even be blue, but it would be perfect. There are two options for the icing provided here: fresh egg whites and meringue powder, the second of which is powdered egg whites manufactured by Wilton. If you plan to make more gingerbread houses in future years, I highly recommend picking a small can of this up from your local craft store. It keeps for years and is so much easier than using fresh egg whites, in my opinion. But it certainly isn’t required! Cake decorating is a hobby of mine, so I have the full cake decorating setup. While that makes it easier to decorate, it certainly isn’t required. You can use a Ziploc bag with a tiny hole cut in the corner for the piping bag and tips. If you have a tip you bought at the store you want to use (like a star tip), you can tuck it into the bag before you decorate. But otherwise, the bag with the hole cut in it will work for icing glue purposes. Finally, you should absolutely search the Internet for more inspiration in decorating your TARDIS—but in the end, your gingerbread TARDIS is an expression of you, so decorate it how you love it! Don’t stress about it being perfect, as long as it fills you with joy when you look at it! My first attempt ended up clumsier than I had wanted it to be, but it still makes me smile every time I see it, so I’ll call it a win. And now for the instructions! 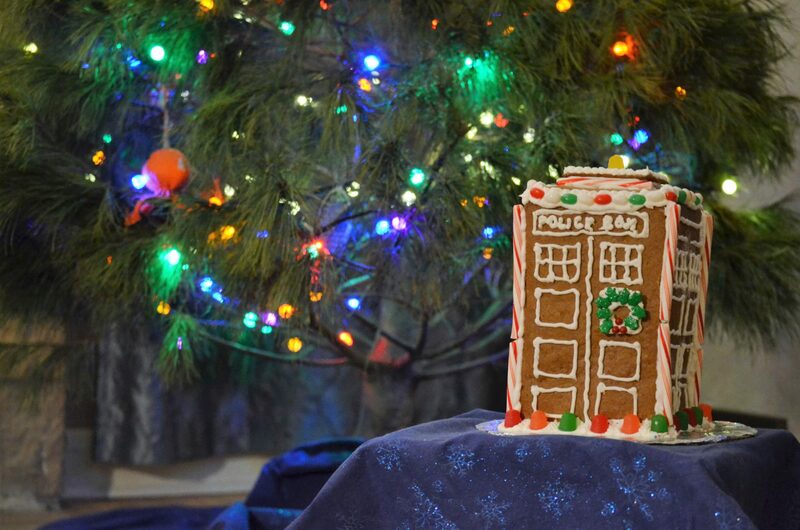 If this article inspires you to make your own gingerbread TARDIS, be sure to share a photo with us either in the comments here or on Facebook or Twitter. Happy baking! Mix. In a large bowl, cream the butter and sugar until light and fluffy, then stir in the lemon zest, lemon juice, and molasses. Gradually beat in the eggs. Sift the flour, baking powder, and spices together and stir into the creamed mixture. Add additional flour ½ cup at a time until the dough holds its shape. Wrap the dough in plastic wrap and refrigerate for 1 hour. Roll and cut. After refrigerating, turn out the dough onto a lightly floured surface (like parchment). 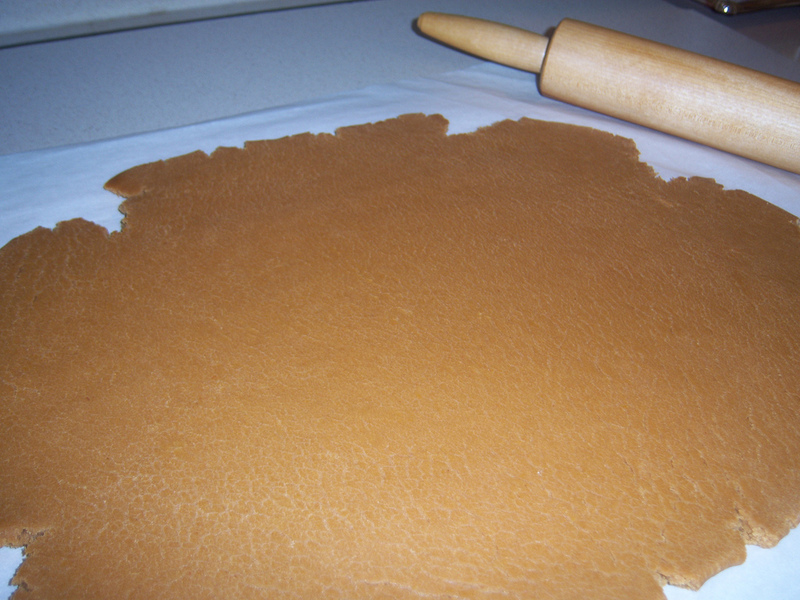 Roll out the dough and cut out pieces according to your template, cutting 4 wall pieces and 1 of each roof piece. Remove the excess dough from around the shapes and transfer them onto greased baking trays (or transfer both gingerbread and parchment onto a baking sheet. if using parchment). Bake. In a preheated 375°F (190°C) oven, bake for 10 minutes or until crisp. When removing from the oven, leave the gingerbread on the baking trays for a few minutes to set, then transfer to wire racks. The dough is likely to spread a little in the oven as it bakes, so while it is still warm from the oven, use the template and a sharp knife to even the edges and ensure uniformity. Let the pieces cure at least a day before you try to assemble the TARDIS. It’s easier if they’re a little dry as they will be sturdier. If using egg whites, lightly whisk them in a large bowl, then gradually beat in the confectioner’s sugar. If using meringue powder, beat all ingredients together. In either case, start with 4 cups of sugar and add more until you reach the right consistency—the icing should be smooth and stand in firm peaks. Note: Royal icing sets up nice and hard and can also be used to sculpt decorations in advance, like flowers, but the key to using it like that is to ensure there is not a speck of grease anywhere on your instruments or bowl. My kitchen is never 100 percent grease free, so my royal icing decorations have never held up. However, for this recipe, you only need it for adhesive purposes and any detail edging, and you don’t need to stress about grease for these uses. Also, royal icing is not delicious. It’s fantastic for building and adhesive, and it is edible, but it’s not tasty as written above. If you’re looking for something you can eat (and enjoy), you can add flavorings such as vanilla or almond extract, and I strongly recommend that you do so if you plan to attempt consumption. You can also make a separate batch of your favorite tasty icing for decorating. If you decide to use the royal icing for adhesive/assembly only, you can halve the recipe as it is written. Fill your icing bag or Ziploc bag with royal icing made using the recipe above. Cover the remaining icing in the bowl with a damp towel to prevent it from drying out while you work. Pipe the basic decoration design onto the pieces before assembling—it’s much easier do it on a flat surface than once the pieces are put together. After piping, let sit for a few minutes to harden. Don’t worry if it isn’t perfect; once it is assembled and decorated with candy, the overall effect of the whole will distract from small imperfections. Piping a line of icing onto your cakeboard that is the approximate length of the bottom edge of the TARDIS wall, then set one of the side walls upright in it. Allow to stand for a minute and set. Ice both edges of a second wall. Pipe a line of icing onto the board at a right angle to the first wall and press the end wall into position. Repeat this process with the other two walls until they are all in position. When positioning walls, take extra care to make sure the corners line up and don’t creep in while you’re positioning. Allow the walls to set for a few minutes, holding them in place if necessary. Pipe a line of icing along the top edges of the walls and put the first roof piece into place. Spread a thick layer of icing on the bottom of the second roof piece and set into place. Alternatively, you can wait until decorating and use candy pieces (like gumdrops or candy canes) to form a base for the second piece. In my TARDIS, I used candy canes. After assembling, allow the pieces to stand for a few minutes while the royal icing hardens. Once complete, use candy to decorate your TARDIS. The sky is the limit! Gumdrops, candy canes, silver decorator balls—use your imagination. Sprinkles are more challenging because royal icing is so hard that they don’t adhere well, but it’s not impossible. You can also purchase basic decorating sets from the grocery store that usually come with some basic decorator tips so you can do a little decorative icing as well.